Several readers have asked questions about the book that I would like to answer here. 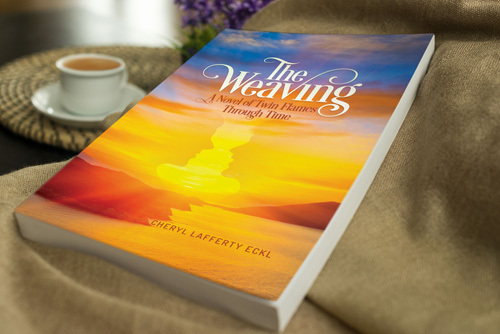 The Weaving is novel, a work of fiction. I have always felt an affinity for the locations in which the story unfolds: Ireland, ancient Egypt, Greece and the lost continent of Atlantis. But such vivid images as emerged in the telling of the stories within this story are products of research and imagination. This is most definitely not a memoire. One of my favorite scenes from the recent movie The Man Who Invented Christmas (about Charles Dickens writing A Christmas Carol) is when he exclaims, “My characters won’t do what I want them to do.” It seems that characters often say the same about their author. At a certain point while I was writing The Weaving, the characters simply took over. They had things to say, their own stories to tell, insights to provide that were a complete surprise to me until I wrote them. I have been told that these experiences are common to writers of fiction. As a first-time novelist, they were news to me. Storytelling is an amazing collaboration between reality and imagination. I had to dig deep into the psychology of characters and the gestalt of places in order to find each one’s reality. Story must be believable. It has to tell the truth, for characters have their own perspective on what is real and true to them. The author must reveal those perspectives without commenting on them. The author is the midwife of the story. Every word must be written (and often deleted) in service of the story—which can be challenging when the story is revealing things of which the author is unaware until he or she writes what the characters want to reveal. 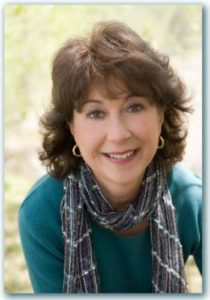 The author must be willing to be vulnerable, receptive and brave, especially when telling a difficult story. And most stories that tell the truth challenge us to look at ourselves. They often help us realize some aspect of self that we may have been avoiding. Stories shine a light on the True Self and the false self—and then give us the opportunity to choose which one to reinforce. 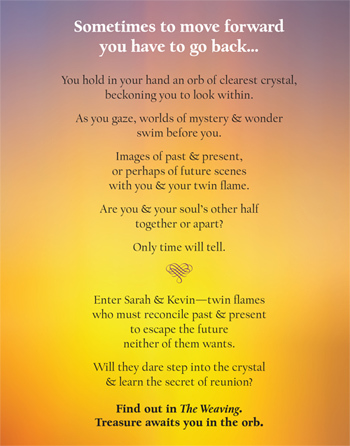 The story of Twin Flames belongs to every one of us, whether we know our twin flame or not. The challenges of finding each other and being together are many, as our characters discover in The Weaving. I hope the book engages you. If it also moves you, the characters and I will be delighted.